In September the spur-winged plovers (or more correctly, the masked lapwings) returned. They didn’t nest on our property this year, but we had one protecting its nest to the west and another trying to stake out a claim to the north. For a few weeks they became so aggressive that it wasn’t possible to step foot on the back lot without one of us riding shotgun with a broom. They came even further onto the front of our property this year, and even tried to attack us as we got into the car on a couple of occasions. Aromatic Jonquils flowering in our garden. September 2014. September gave us some lovely flowering of our various bulbs. First the daffodils, then the tulips through into October, the jonquils were up at about the same time, and the dahlias have recently shown their first green shoots. 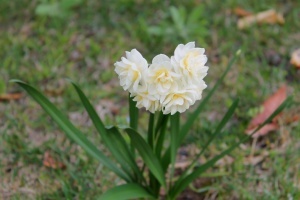 We had a few jonquil bulbs left over from a previous planting, and I decided to put these in the orchard, under the grass between the trees. It was late in the season for them to go into the ground, and they didn’t do very well, but hopefully the bulbs will have managed to divide, and they will return next spring. 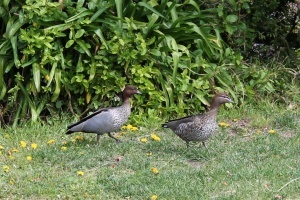 These two ducks were regular visitors to our garden throughout Spring of 2014. We gave the new veggie beds more of a working out. I dug in a variety of composts and manures in September, and then we planted some seedlings in October. We’ve had great success with lettuces, but the broccoli has attracted a bunch of white moths and the leaves are looking very poorly (hopefully the developing broccoli heads will be unaffected). A single zucchini plant has already given us eight near perfect zucchinis, and shows no sign of stopping. 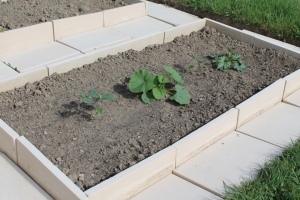 I also planted a pumpkin vine; I knew the dangers, but decided to give it a go anyway. It is of course thriving – still a long way from producing any fruit, but already overflowing from its bed (and strangling two eggplants and encroaching on the prized zucchini plant). I will have to keep an eye on it, and if it threatens taking over the whole district, I’ll get rid of it. Two eggplants, a pumpkin and a zucchini plant. Late October 2014. 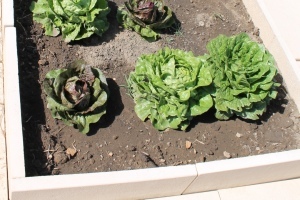 Lettuces doing well in our new veggie beds. November 2014. Our fruit trees are doing very well. The two peaches and three apple trees are covered in fruit. 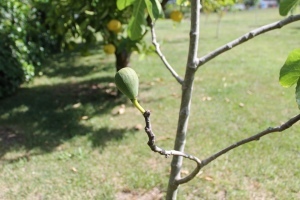 The cherry, pear and fig trees have managed a very small crop, but are otherwise looking healthy. 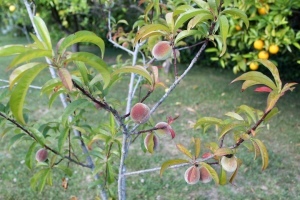 The apricot looks fantastic, but didn’t manage any fruit this year. I think it was the windy and wet weather when some of the trees were flowering that has reduced their yield. Our tree has only managed a single fig, but it looks delicious. I removed about half the developing fruit from this little peach tree to stop it from being overloaded, but there’s still heaps. After my success with laying down mulch last May, I decided to order another 3 cubic metres and continue on down the property’s eastern border. It seems that everyone else had the same idea for spring, and I had to wait several weeks for the mulch to arrive. 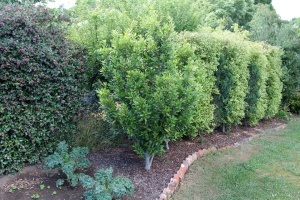 When it did, I spent a very active week in mid-November laying down newspaper and mulch along the border, as well as on our new soft fruit patch, around the walnut and almond trees, and reapplying it to some scruffy patches on the Australian native beds. 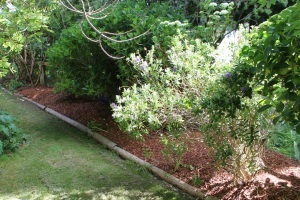 The results were very satisfying, and I have resolved to order mulch at least once a year, as it looks so splendid. A layer of newspaper covered in mulch has tidied up the border beds significantly. Kale, bay trees, screening plants, and some dahlias poking their heads up through the mulch. I’ve also updated the website entries on our waratahs, and our walnut and cherry trees, as well as putting up photos of this year’s Bundanoon Garden Ramble.